Elements Shower Enclosure Trays or Shower Trays, low profile shower trays sizes 700mm 800mm 900mm 1000mm 1200mm shapes quadrant in your cart. 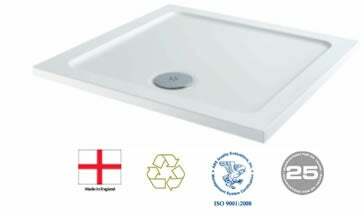 The Elements range of low profile shower trays are available in both flat top and upstand options(With the use of a Flexi Seal Strip (SU210)). At only 40mm high they lend themselves to the latest bathroom trends and carry all the benefits of a cast stone tray. These trays suit any installation and if a raised installation is required the contoured underside leg location could not be easier. Please note: all MX Elements Shower Trays have a tolerance of +10mm then +/- 3mm at the base, and +6mm then +/- 3mm at the top of the tray.